While we all love our cutting-edge gear, there's still a place for some of the old-school gadgetry that wowed 'em back in the '80s and '90s, such as Bandai's newest take on the Tamagotchi virtual pet. 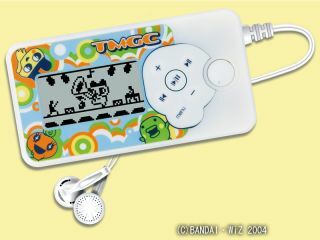 The Tamagotchi Music Player (or just TMGC to its pals) combines an audio player with a version of the Tamagotchi virtual pet-raising game made famous by Bandai in 1996 for just ¥7,140 (£32). The player is of the most basic variety and is aimed squarely at young children. It simply records audio in real time from any source, such as a TV or CD player, at either high or low quality. The maximum recording time is two hours, while the battery life is seven hours.